‘Anagramary’, which was originally released in 1997, brings, in anticipation of this reformed band releasing their comeback album, a conclusion to Angel Air’s reissuing of the Red Jasper catalogue. Often described as Jethro Tull meets Motorhead, Red Jasper were entering their final faze by the time this album was ready for release. Lead singer Davey Dodds was becoming less and less involved, hardly featuring on this release, with the enemy of many a band, musical differences, peeking over the Red Jasper horizon: something which comes across strongly on the nine tracks on ‘Anagramary’. Almost completely gone are the brash, punky overtones that felt so vital to the early Red Jasper output, but equally the band’s folky tendencies also feel muted and while there are still tin whistles and mandolins in evidence, this is an album teetering on the brink of “standard” neo-prog, with other influences slightly spattered throughout. Eastern sounds ooze in between early Marillionesque guitar work and more overtly folk driven ideals on ‘Babylon Rising’, while ‘Waterfalls (Rhaeadreau)’ washes into Jean Michel Jarre ambient territory. Both songs are good, but sandwiched in between comes the theatrical ‘In The Name Of Empire’, which is all early Marillion inspired keyboard parps, tin whistle instrumentals and multi-charactered vocals. The straight ahead rock of ‘People Of The Hills’ and the ever evolving ‘Island Of The Mighty’, which veers from acoustic passages, to vocal snarls and thick keyboard and guitar duels. In the end it all feels like a band desperately spinning around, searching for a direction, ultimately leaving you and them, dizzy and disorientated. With outside pressures growing and motivation to drive the band on beginning to wane, Red Jasper stuttered to a halt before they would even play any of these songs on stage, the arena in which this band always truly came alive. Added to this reissue is a re-recorded, 1994 version of the band’s early classic ‘Pull That Thumb (Off The Top Of Your Head)’, but even this staple of the Red Jasper set sounds weak and over produced in this guise, lacking the vibrancy which marked the original version out so inspiringly. 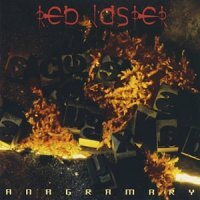 ‘Anagramary’, while an interesting and varied snapshot of very English neo-prog, isn’t Red Jasper’s finest moment and neither should it be your starting point with a band whose earlier albums offer so much more brutal, yet beautiful force.